The things that a worship leader says and does are important. Why? Because in part, over months and years, it helps shape a congregation’s understanding of God, scripture, and the living relationship of Father, Son and Holy Spirit with all creation. Wow! That sounds daunting! So for help with this important task, we’ve been looking at what Andrew Purves has to say in The Resurrection of Ministry: serving in the hope of the risen Lord (IVP 2010). We saw that the crucial first step to ministering in the hope of the risen Lord is to focus on the person that is Jesus—not some general concept of God. Everything else follows as a result of this confession, and the truth it bears witness to. The urgent second step is a willingness to admit that some rewriting of our ‘roadmap’ to faith and ministry is required. Purves says we must give additional thought to the central issues of Christian faith and admit that we are sometimes unfaithful to the reality that is at the core of all we are and all we do—that Jesus lives! We grasp the things of God dimly, and only by hard study may we grasp them somewhat less dimly. Our spiritual lives, often fragile and shallow-rooted, periodically need to be reclaimed and rerooted. (p. 32). Without carefully refocusing on the fact that Jesus is living, we then remain stuck in the mood of Holy Saturday—the day prior to his resurrection—and are in desperate need of reframing our ministries. The core problem, perhaps the terrifying problem, is there is no Christian faith on Holy Saturday and no possibility for Christian ministry because all we have at that point is Jesus as a dead moral and religious influence. He “lives” only as a particular instance of a general religious memory…. 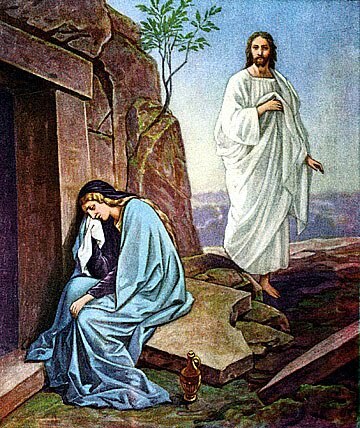 If we remain stuck in the mood of Holy Saturday we have separated ourselves from the resurrection joy and hope of the Easter Lord. All we have is a huge burden to carry because at this point everything seems to be left up to us to do. It is little wonder, then, that we are always weary (p. 33). So here is the central paradox that confronts us when we try to think about the resurrected Jesus: he is the central perspective from which all of Christian faith is determined, yet we have no human categories of thought by which to bring him to expression. The sentence, “The resurrected Jesus is like…” cannot be completed. Easily we can say that we have before us a mystery to be adored rather than a problem to be solved… (p. 35-36). It is, as it were, as if Jesus takes us by the hand and leads us to knowledge and speech of the Father. Or, in a different image, he speaks himself and God into our minds. Just as a child learns speech by being spoken to by his or her parents, as we are spoken to by Jesus we are able to bring him, and indeed God, to appropriate speech. Jesus…speaks himself into our speaking of him. 1) Jesus spoke forth himself while on earth. 2) Jesus spoke forth himself during the forty days between the resurrection and the ascension. 3) Jesus speaks forth himself today as the ascended Lord, not now limited by the created categories of time and space. He speaks forth himself by the Holy Spirit, especially through he proclamation of the sermon. 4) Jesus will speak forth himself as the end (as the eschatos) when he gathers all things together and gives them to the Father. Theological speech is possible therefore on the grounds of Jesus bearing witness to himself through the Holy Spirit and of our being converted in the structures of our thinking and developing speech that has its sole ground in him… Thus we can speak of the risen and ascended Lord. Such speaking is our “rational worship” (Romans 12:1-2) in which we acknowledge that we speak as we are spoken to by the risen Word who bears witness to himself. Speech concerning the resurrected Jesus is confessional speech, the speech of faith. There are no outside references or independent warrants we can appeal to. Faith speaks to faith, and the Holy Spirit alone can open the ears if another would also hear (pp. 36-37). God’s richest blessings, as you continue in faith, by the Holy Spirit, to confess the risen Lord, who has revealed the Father to us, and who lives and reigns to give us his joy!